This essay details the process of composing the electronic collection of poetry Who Unfolded My Origami Brain?, which was published by Fence Digital, a new imprint of Fence Books. By contextualizing my e-book with Jay David Bolter and Richard Grusin's ideas of immediacy and hypermediacy, I challenge the facile but enduring opposition between the sensuous materiality of print culture and the supposed dematerialization of digital culture. Who Unfolded My Origami Brain? (Fence Digital, 2017) collects 99 fragments, aphorisms, and typographic poems. I created these minimalist texts—which are, by turns, gnomic, rhetorically playful, lyric, and apocalyptic—by painstakingly typesetting and printing them by hand with a Trodat 5253 Self-Inking Custom Stamp, a mechanism that accommodates three and four millimeter rubber type. James Belflower, Fence Digital’s book designer, then remediated the prints to create a visually-striking, hypermaterial page by blending digital and analog textures. He also embedded hypertextual buttons into the bottom of the pages, allowing for multiple pathways of reading. 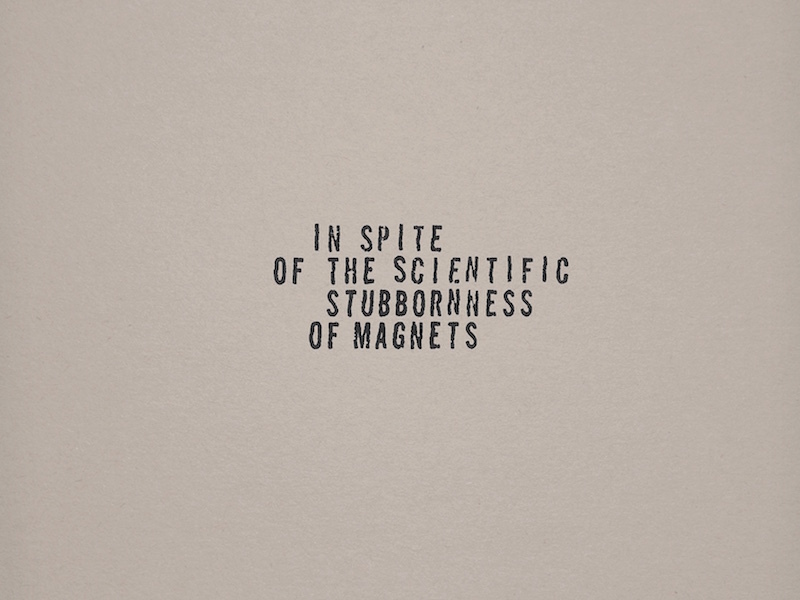 I began making these hand-stamped prints when I was approached by Container, a purveyor of artists’ books and book-objects, to transform a Rolodex Open Rotary Card File into an aesthetic/literary object. My solution to working with these unconventional materials was to use the Trodat stamp set to make poetic impressions on the small rectangular Rolodex cards. I had been impressed, as it were, with the Chilean writer Matías Celedón’s use of the same Trodat stamp, which he employed to create his hauntingly allegorical novel La filial (Alquimia Ediciones, 2012).1 How might this work with a non-narrative project?, I thought. Setting the type piece by rubber piece, from right to left, was laborious enough, but to remove the type, clean it, and return it to its 1 ½" x 4" plastic tray only to start the process again was a truly perverse exercise, a deliberate use of a technology against the grain. I had to set the type with a pair of plastic tweezers, which eventually cracked from repeated overuse; unable to find a replacement and unwilling to pay for a new stamp set, I used Gorilla Tape to fix them. But despite these difficulties, I had come to appreciate the glacially slow process of composing, designing, typesetting, and printing which allowed for a maximum amount of meditative deliberation. Unlike quickly firing off a tweet—such as “Despite the constant negative press covfefe” (Qtd. in Flegenheimer) or “Just heard Foreign Minister of North Korea speak at U.N. If he echoes thoughts of Little Rocket Man, they won’t be around much longer!” (Qtd. in Osborne) —I had to commit to my text over a certain duration if I wanted to see it materialize. 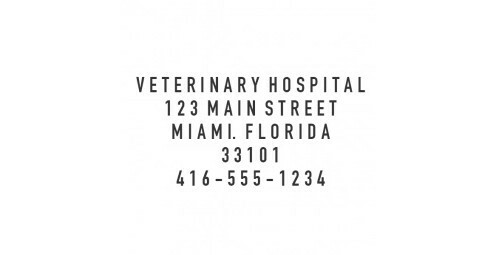 I had also come to appreciate both the micro-texts I had been impelled to generate under multiple physical constraints and the somewhat messily textured letters that the Trodat produced—no doubt a result of my amateur typesetting, tracking, kerning, and printing skills. Figure 2. Scan of hand-stamped Rolodex card. I scanned a selection of the Rolodex cards—fig.2 presents a draft or study that didn’t ultimately make it into the book—and worked with Fence Digital to give my hand-stamped impressions a digital afterlife. James Belflower and I decided on using colored pages according to a five-color scheme. I then organized my stamped impressions into five categories according to formal/grammatical properties: the visual and concrete poems were paired with the white/natural color; the questions were paired with the bright brownish orange color; the sentence fragments were paired with the peach/grey color (see fig. 3); imperatives were paired with a dark gray color; and complete sentences were paired with a lighter gray. James added special typographic buttons—sampled from some of the stamped impressions—on the bottom of the page, allowing the reader the option to “read by color”: following the arrow buttons on the bottom of the page allows the reader to jump—either forward or backward—to another similarly colored page. Or, by pressing the middle button, the @ symbol, the reader is sent to a randomly assigned location in the book. Figure 3. From Who Unfolded My Origami Brain? Of course, anyone who has had to dispose of an old computer or has required a VGA adapter to project a document during a presentation or used a touchscreen monitor to click and zoom around a multimedia website has had to deal with the concrete and tactile thingness that makes digital reading and writing possible.2 Bloomfield’s complaints about the electronic mediation of social life are puzzling: do we really want to depend upon the reification of money in paper form to make paying for goods—somehow—more sensate? And don’t Howe’s print books also mediate “the world of objects” as does, say, Stephanie Strickland and Cynthia Lawson Jaramillo’s digital poem slippingglimpse (2007)? One of my goals with digital book design for Fence Digital is to reevaluate the boundary between the virtual nature of digital information and the viscerality of text. So, when designing, I think of the project as a print book, but I’m also considering how digital extratextual qualities (video, image, animation, hyperlinks, etc.) might contribute to its textualization. I design with this process in mind and emphasize the generative moment that occurs when a reader interacts with a digital book as something that happens rather than something that exists. 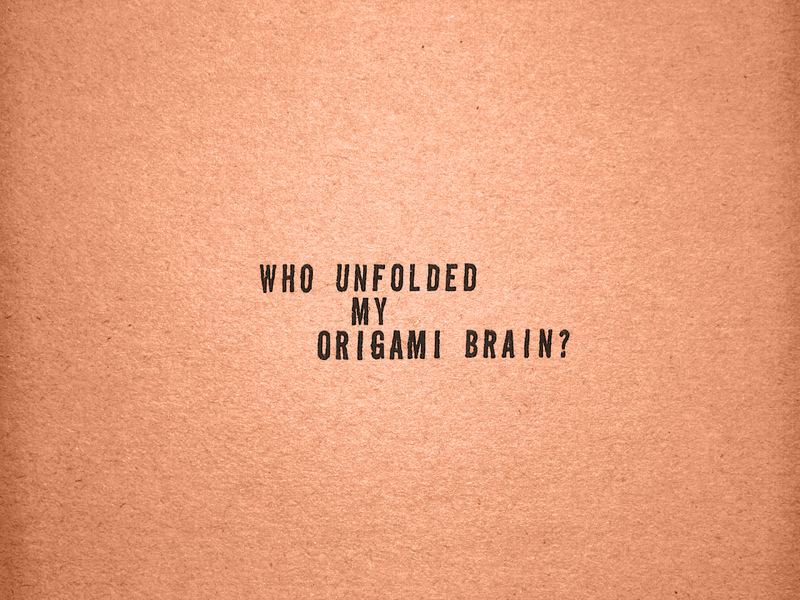 [...] [In Who Unfolded My Origami Brain?] readers travel across the stippled impress of [Leong’s] stamps and the pulpy pages that yearn to be touched. And readers do touch, not only as they push the buttons that transport them randomly through the book, but because the changing page colors make Who Unfolded My Origami Brain? as much a cognitive read as it is a haptic one. Along with the other projects I’ve designed for Fence Digital, Who Unfolded My Origami Brain? opens a space on the shelf for what might be considered a digital book object. What Belflower grasps (and what Bloomfield misses) is the fact that new media poetry “oscillate[s] between immediacy and hypermediacy, between transparency and opacity” (Bolter and Grusin 1999, 17), which gives a reader a sensory experience of thingness on multiple levels. Who Unfolded My Origami Brain?, for example, offers a certain thickness or opacity of language since I tended to highlight the materiality of the signifier through a density of verbal patternings and rhetorical figurations. But the book also offers an immediate perceptual experience of dark ink and its papery substrate—what Belflower is calling the “stippled impress” of the stamps and the “pulpy pages”—even if it effaces, to some extent, the fact that the screen is remediating the more conventionally presented page of printed poetry. 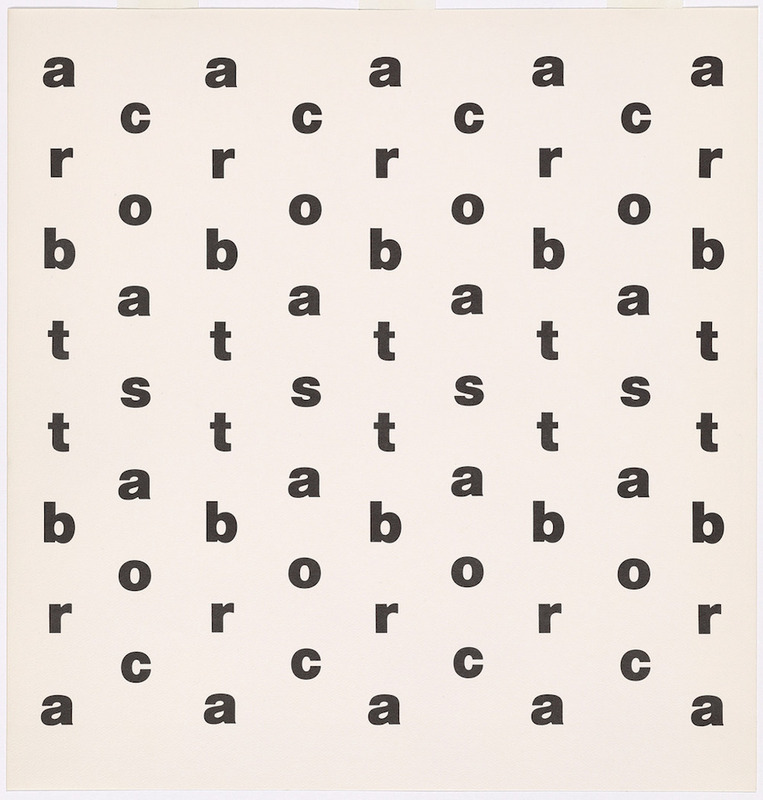 While I was in LA I made a visit to see a small concrete show [“Concrete Poetry: Words and Sounds in Graphic Space”] at the Getty [Research Institute] that was mostly focused on Ian Hamilton Finlay and Augusto de Campos. It was a wonderful show, a kind of greatest hits. But seeing the show and reading your book I feel the stuffy formality of their project in a way I hadn’t before [...] Maybe it is the difference in visual presentation. Your stamped letters almost shimmer compared to their fonts. Figure 4. “Acrobats,” Ian Hamilton Finlay, 1964. From The Blue and the Brown Poems (New York, 1968). Image from Getty Research Institute. The “shimmering” visual presentation of Who Unfolded My Origami Brain? depends upon a mix of old and new technologies: the luminosity of the computer screen as a reading interface, Belflower’s “post-production” Photoshopping of stippled foreground on monochromatic background, and my initial recourse to a rudimentary system of letterpressing. The plasticity of the Trodat’s rubber type, among other factors, created a range of inconsistencies in the printed letters, turning the phrases into unique and textured objects to be “looked at” as much as textual signs to be “looked through” for referential content. Too much pressure in printing distorted the type while dirty type produced imperfect transfers. But my wager was that I could redeem the errors and idiosyncrasies in the printing process by conceiving of them as part of an “autographic” signature.6 I wondered—to borrow from the parlance of the visual arts—if there could be such a thing as “gestural” printing or “action” typesetting. In contrast to the standardized type and even spacing of Finlay’s lithographic print Acrobats (see fig. 4 above), Who Unfolded My Origami Brain? lets the viewer more directly apprehend the messy material processes that it took to manually place one letter next to the other. 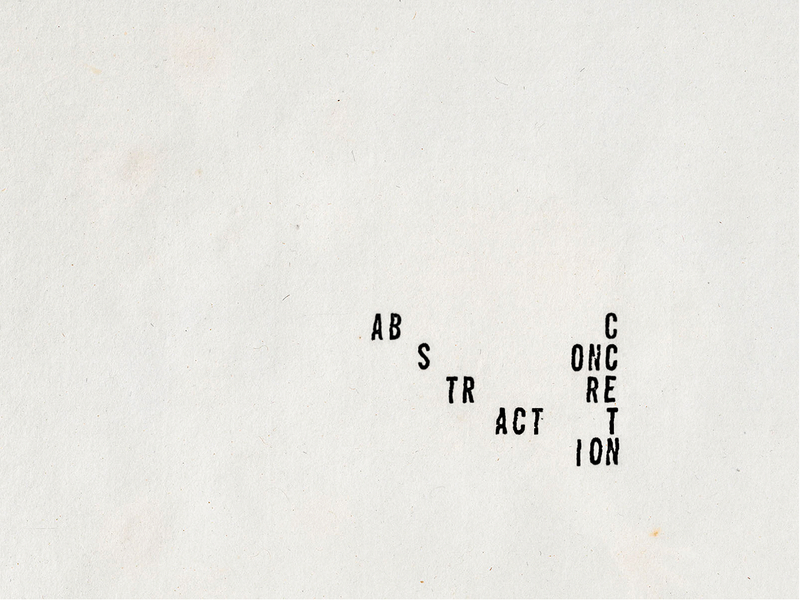 The book’s fragments are minimalist in scale but more “maximalist”—or excessive—in typographical irregularity. In reading Who Unfolded My Origami Brain?, one encounters the immediacy of the signifier’s material features, the mediacy of the morpheme, and the hypermediacy of the e-book’s design and architecture. For Bolter and Grusin, “hypermediacy offers a heterogeneous space, in which representation is conceived of not as a window on to a world, but rather as ‘windowed’ itself—with windows that open on to other representations” (1999, 34). In fig. 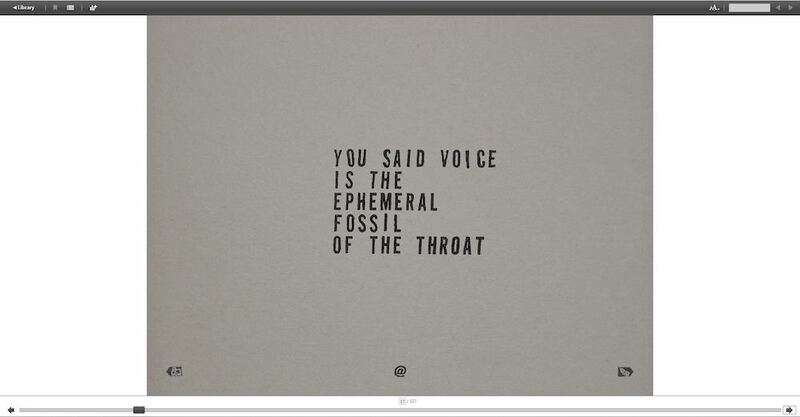 5, there is an epigrammatic text—“YOU SAID VOICE / IS THE / EPHEMERAL / FOSSIL / OF THE THROAT”—on a light grey background. The poetic text is immediate for some of the reasons I outlined above. But the overall composition is also hypermediate: the three hyperlinked buttons in the paratextual space at the bottom of the page mimic, even parody, the form and function of the horizontal navigation bar of Adobe Digital Editions.7 This para-/hyper-textual space “remind[s] the viewer of the medium” (Bolter and Grusin 1999, 272) by offering three additional navigational options besides using the two arrows and the sliding thumb of the ADE interface. Given that a reader can choose to go backwards or forwards linearly or use the hyperlinked buttons to either “read by color” or be sent to a randomly assigned page (via the @ button), it is easy to get caught in strange loops and pathways within the 107-page book. Who Unfolded My Origami Brain?, then, is a book that one can get “lost in” but not at all in the way that one “gets lost” in a novel by projecting oneself in an immersive, narrativized world. Figure 5. Screenshot of Who Unfolded My Origami Brain? within the Adobe Digital Editions interface. The short sentences and fragments of Who Unfolded My Origami Brain? are meant to be combinatorial—potential building blocks for any potential number of more articulated poems. In other words, I imagined Who Unfolded My Origami Brain? to be, à la Raymond Queneau’s Cent Mille Milliards de Poèmes, a modest poem-making machine. For the launch of the title, which took place on July 16, 2017 in Hudson, NY, I wanted to demonstrate this generativity by treating the book as a suggestive and dynamic score rather than as an autographic object: I prepared for the launch reading a poem called “Dear Balloon Animal,” which I composed by incorporating many of the brief texts of Who Unfolded My Origami Brain? into a larger arrangement. As James Belflower rightly notes, this is a book that “yearn[s] to be touched.” It is also a work that—across the various media forms of codex, Rolodex, computer, and brain—yearns to unfold and to be unfolded. as a fugue in a centrifuge. that there were satellites falling into the wine-dark sea. are comma splices connecting sky to sky. on the concentric circles drifting away. Who turned down my encephalophone? on your side of the labyrinth? Don’t slurp the surplus value. closing the kerning between you and me. then scribal corruption is my middle name. 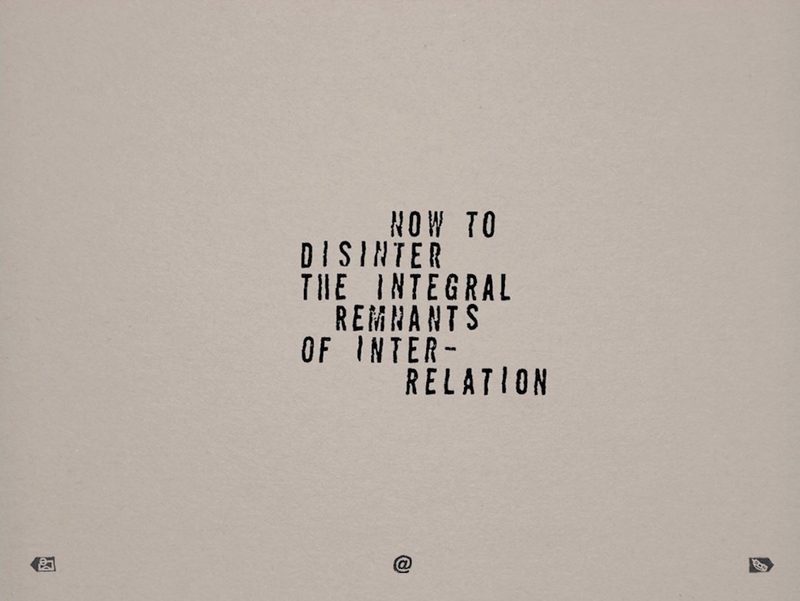 the integral remnants of interrelation. 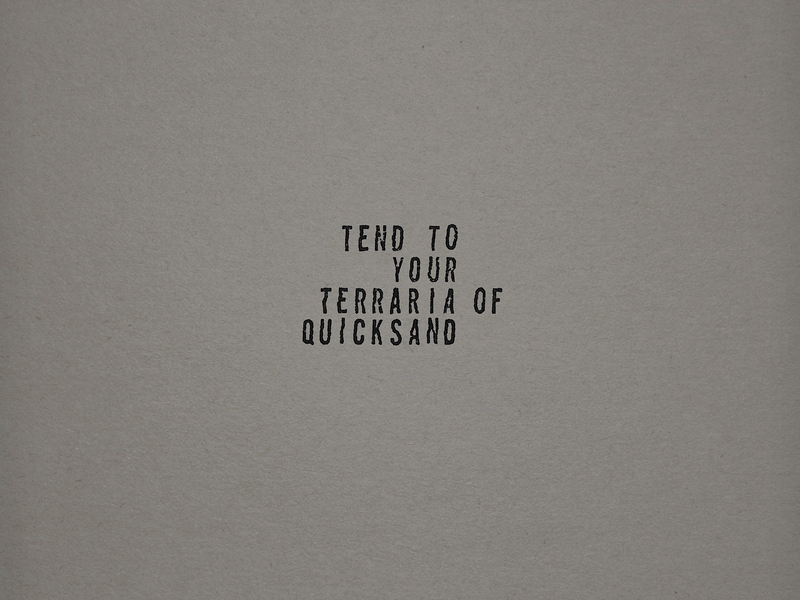 to your terraria of quicksand. not even the birds can subpoena the dawn. is formal but not real”? of whiplash and syllable scatter. As with Bloomfield, I am not rigorously distinguishing between “thing” and “object” for purposes of this essay. For Bill Brown, following Heidegger, a broken computer or VGA adapter, tools that no longer function, make us “confront the thingness of objects” (2001, 4). Bloomfield is participating in what Bill Brown has called “the melodrama of besieged materiality” (2010, 26). Belflower’s view is consonant with N. Katherine Hayles’ call for a more sophisticated account of the materiality of literary texts. Hayles suggests that we “reconceptualize materiality as the interplay between a text’s physical characteristics and its signifying strategies. This definition opens the possibility of considering texts as embodied entities while still maintaining a central focus on interpretation. In this view of materiality, it is not merely an inert collection of physical properties but a dynamic quality that emerges from the interplay between the text as a physical artifact, its conceptual content, and the interpretive activities of readers and writers” (72). According to W.J.T. Mitchell, “the medium of writing deconstructs the possibility of a pure image or a pure text […] Writing, in its physical, graphic form, is an inseparable suturing of the visual and the verbal, the ‘imagetext’ incarnate” (95). My use of the term “autographic” alludes to Norman Goodman’s distinction between “autographic” and “allographic” arts. For Goodman, poetry is allographic because it isn’t subject to forgery (as in the case of painting): “The is no such thing as a forgery of Gray’s Elegy. Any accurate copy of the text of a poem or novel is as much the original work as any other.” By contrast, printmaking is autographic because it is “singular in the earliest stage” even if it is a multi-stage and multiple art form that can produce many impressions from a single plate (115). Who Unfolded My Origami Brain? encourages a complex ecology of meaning making that crosses autographic and allographic categories. Following Philippe Lejeune, Gerard Genette considers paratextual space to be “‘the fringe of the printed text which, in reality, controls the whole reading’” (Genette 1997, 2). Belflower, James. 2017. Email to author. October 9, 2017. Bloomfield, Mandy. 2016. 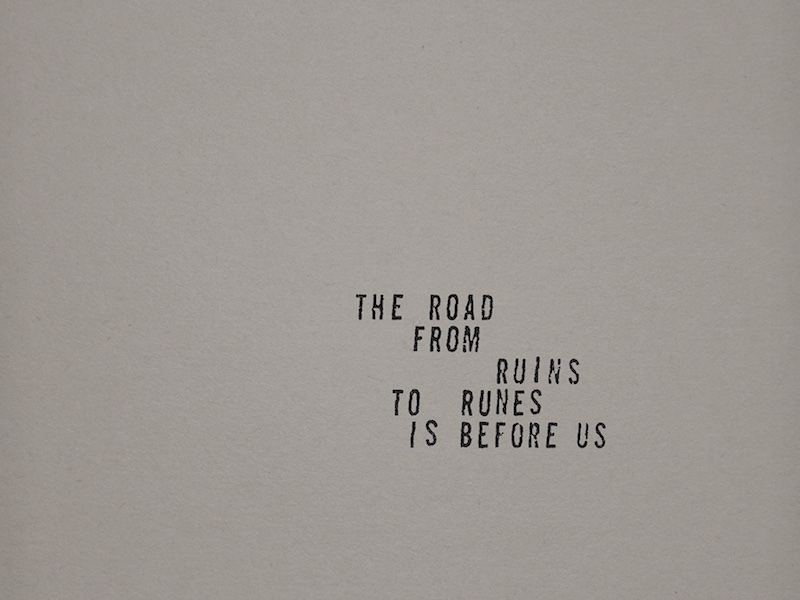 Archaeopoetics: Word, Image, History. Tuscaloosa: University of Alabama Press. Bolter, Jay David and Richard Grusin. 1999. Remediation: Understanding New Media. Cambridge: MIT Press. Brown, Bill. 2001. “Thing Theory.” Critical Inquiry 28.1: 1-22. ---. 2010. “Introduction: Textual Materialism.” PMLA 125.1: 24-8. Celedón, Matías. 2016. La filial. 3rd ed. Santiago de Chile: Alquimia Ediciones. Celedón, Matías. 2016. The Subsidiary. Translated by Samuel Rutter. Brooklyn: Melville House. Fence Digital. “About.” Accessed October 13, 2017. URL. Flegenheimer, Matt. 2017. “What’s a ‘Covfefe’? Trump Tweet Unites a Bewildered Nation.” New York Times. Accessed October 13, 2017. URL. Genette, Gerard. 1997. Paratexts: Thresholds of Interpretation. Translated by Jane E. Lewin. New York: Cambridge University Press. Goodman, Norman. 1968. The Languages of Art: An Approach to a Theory of Symbols. Indianapolis: Bobbs-Merrill. Hayles, N. Katherine. 2004. “Print Is Flat, Code Is Deep: The Importance of Media-Specific Analysis.” Poetics Today 25.1: 67-90. Leong, Michael. 2016. “Testing Form: Novels by Alejandro Zambra and Matías Celedón.” Hyperallergic Weekend. Accessed October 15, 2017. URL. ---. 2017. Who Unfolded My Origami Brain? Albany: Fence Digital. McAdams, E.J. 2017. Email to author. July 25, 2017. Mitchell, W.J.T. 1994. Picture Theory: Essays on Verbal and Visual Representation. Chicago: University of Chicago Press. Osborne, Samuel. 2017. “Donald Trump Appears to Threaten Regime Change against North Korea: ‘They won’t be around much longer’” Independent. Accessed October 14, 2017. URL. Strickland, Stephanie and Cynthia Lawson Jaramillo. 2007. slippingglimpse. doi:10.20415/hyp/004.g06. | Artist site.